Try as I might, I can’t get my head around kale smoothies. I’ve tried many a kale concoction and I know they’re good for me but that does not make them any easier for me to like. As kale smoothies are out, I’ve been trying out more ways to include it in my lunches. When I’m being healthy, I’m always trying more salad ideas out that don’t leave me hungry again by 3pm. 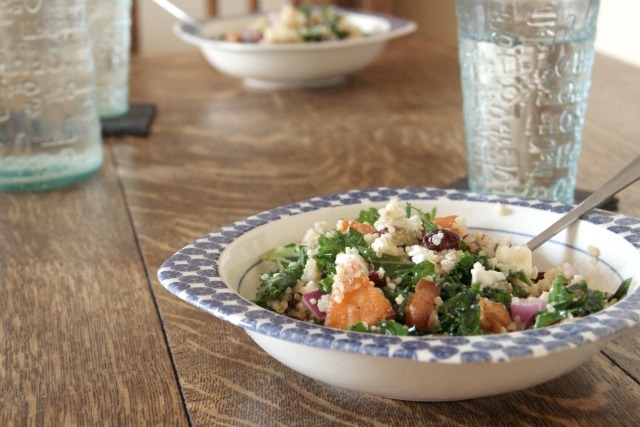 This salad is quite hearty with sweet potato and quinoa to keep me full up and feta because, well, I just love feta. 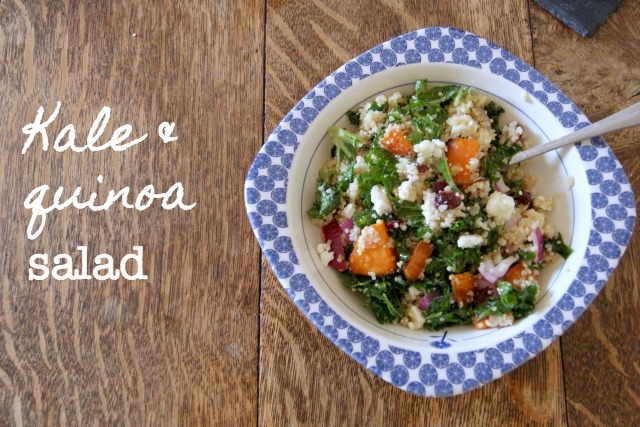 I also love salad ideas that combine ingredients that I cook in a big batch and use for other meals, like the sweet potato and quinoa. Start by getting the cooking bits going. Roast the diced sweet potato in the oven on a high heat (I go for gas mark 7) for around 25 minutes, or until they're cooked through. 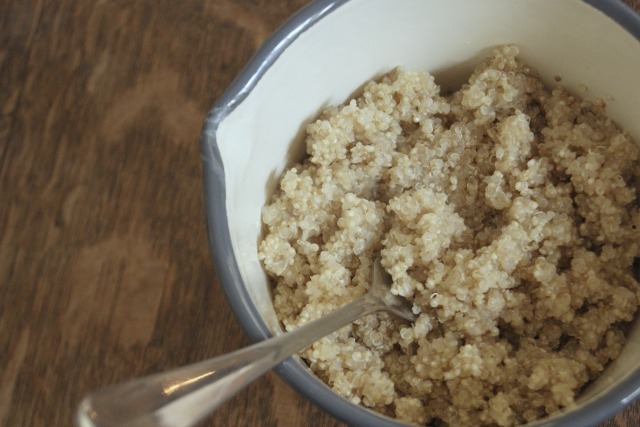 At the same time, rinse your quinoa and add it to twice the volume of water (i.e one cup of quinoa to two cups of water). Bring that to the boil then leave to simmer until all the water has been absorbed. Set them the quinoa and sweet potato aside to cool once they're done. Dice the onion and add a splash of the apple cider vinegar to it. This will take the eye watering sting out of the onion and will leave you with the sweetness. Mix your dressing, which is made up of the apple cider vinegar, olive oil and honey. Slice the kale up and then add the dressing. This is where this may get a bit weird. Massage your kale. The more you massage it, the better it will be - you're aiming to beat up the kale a bit so the dressing can get in and soften it up. Fresh kale should hold up nicely and won't go soggy. Once the cooked ingredients are cool, it's time to throw it all together. 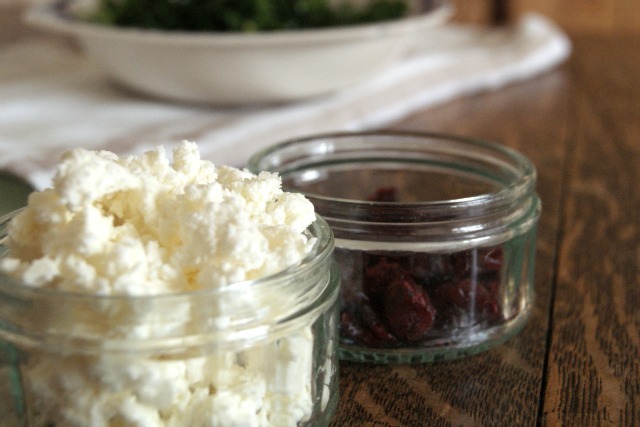 Mix the sweet potato, quinoa, kale, feta, cranberries and onion together and serve (or pop in the fridge for tomorrow, it's just as good the day after). Your comments are always welcome, what are your favourite salad ideas? Or what else can I do with kale to make me like it more? !